The way in which we use our home has changed a lot over the years. Once upon a time it was just a place to lay our heads after a hard days work, and to raise a family. Nowadays the home has become a place of work for many, due to technological advances that allow us to clock-in remotely. The modern family demands a multitude of spaces in which to span out, chill out, study and exercise. In response to all of these new demands on the home, garden sheds have changed a lot too. The once humble tool shed has now found higher status as a fully fledged living space. 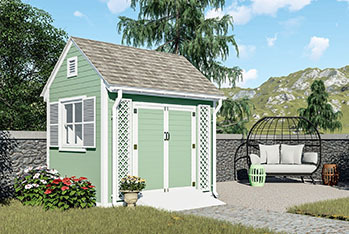 With an array of different designs to choose from, there are a whole host of ways to extend living space with a garden shed. Reimagining the lowly garden shed as a garden room can make a family hub out of a little used area. Placing an extension of the home just a little way across the lawn will also evoke a closer connection with the outdoor space, by making it a central piece and passageway in daily life. You can choose an off-the-shelf shed or if you’re quite handy then there are lots of free shed plans with step-by-step instructions available online. 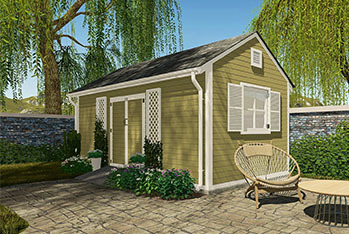 One of the most popular uses of the modern shed is as a private office space. Having the home office stand completely separate from the rest of the house helps minimise distraction – whether that’s kids and spouses wandering in and out, or the sweet temptations of home drawing you from behind your desk. 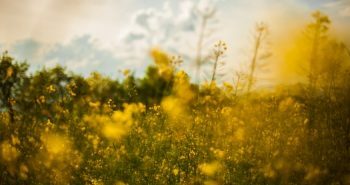 When you actually ‘leave’ home to go to work every morning (even if it is only a few metres across the lawn), you are able to establish a different mindset for yourself and for your family. You also get to lock up and walk away at the end of the working day rather than having all those files and papers staring at you from a worktop setup just off the kitchen, or worse, your bedroom. Home should be a place for relaxation and pure family time, not feeling the pull of paperwork. With an garden office, you get to make a clear cut distinction between home and work life. 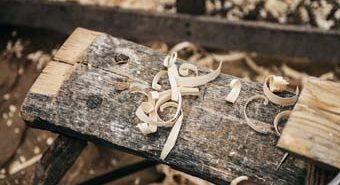 Anyone who is on any arts and crafts bandwagon would love to have their own space, where they can make as much mess as their heart of art desires. A garden room is an ideal place to situate an art studio, craft room, sewing room or an altogether creative space. Having a hobby room completely separate from the rest of the house means that you can properly organise craft supplies – or leave your creativity strewn in any which way you like without the worry of guests wandering in on it. 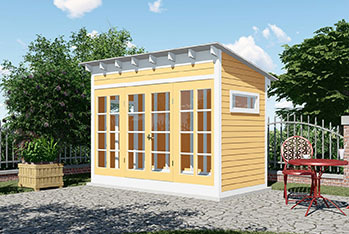 You can team your shed design with a patio and pagoda to create an outdoor extension of your creative space. where you can draw inspiration from the sights, sounds and scents of the garden. Whether you’re a professional musician, an amateur tinkerer, or an avid music fan, then for the sanity of your family you may want to consider an outdoor music room. Headphones keep the beats from bouncing but what about all of the paraphernalia that comes with? Music equipment and music collections take up a vast amount of space in the home; creating a dedicated area to house your musical passion will prevent it from becoming someone else’s irritation. Sheds offer an independent space for teenagers, either as a hangout lounge or a games room. With youth group facilities on the decline, it’s a great idea to give older kids a safe space to hang with friends. If you’d feel better keeping a parental eye on teen get togethers then you could always keep things transparent by opting for an outdoor room with a front of french doors. Remember there are benefits for you in giving them their own space too – think peace and quiet and an out of reach fridge. The gym membership is now a common household bill. Too often though, that gym membership fee goes to waste as we struggle to fit a gym visit between other commitments. After being out at work we feel the pull of home; before work, no one really likes showering at the gym or crumpling their work attire into a gym bag. Consider how convenient it would be to have a private gym on home ground, with the comfort of your own shower. Choose a shed with an expanse of doors that open it up to the garden for a beautifully breezy outdoor exercise experience in warmer weather. OK, so it’s not a new idea to use a garden shed as storage space, but it is a good one. By creating a new home for large items that usually clog up the main home, you are clawing back valuable square footage. 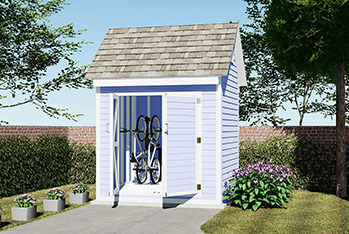 Even a small storage shed can house bicycles on brackets, hide away oversized toys, and declutter rarely used bulky kitchen gadgets. If you’re currently paying self storage unit costs, then think of the cash you could save by building a storage locker in your own back garden. 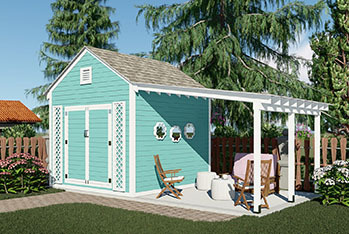 How would you extend your living space with a garden shed?